Explore the features that empower your team and unify your business. With Arrow PSA, manage your entire professional services business with a single solution developed 100% natively on the Salesforce platform. From Concept to Completion, manage your projects effectively with the proper tools. Manage your projects more effectively with an intuitively designed user interface, with standardized project management functionality and features. Optimize your entire service and delivery process, from project inception to closure; with configurable best practices to ensure that your customer experience is positive and consistent. Arrow PSA’s dynamic project scheduler updates your project plan with built-in task management, and robust dependency management capabilities (the extent to which a task is dependent on the completion of another task). Gain financial control and profitability with one comprehensive, integrative platform. 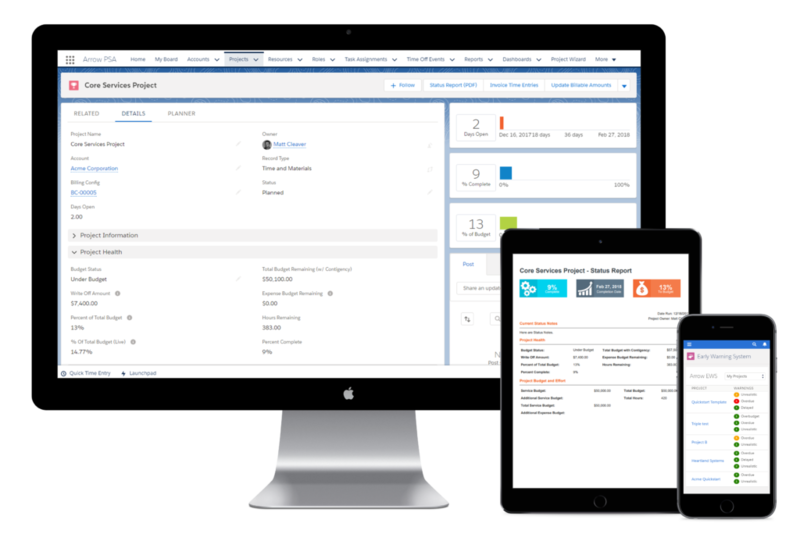 Improve the profitability of your organization with real-time financial management of project budgets and expenses. Give your project managers full visibility into your projects’ financial health. Project billing and Client Invoicing. Increase the operational efficiency of your business with flexible project billing and client invoicing. Create different billing engagements, billing rates, and flexible invoicing options based on your business processes. Optional integration with your back-end General Ledger (GL) and Enterprise Resource Planning (ERP) System makes adoption and adaptation to Arrow PSA easier, providing a full 360 – degree solution for your organization. Achieve better visibility, and a better understanding of your team’s productivity. Real-time, detailed time tracking enables your team to quickly, accurately, and conveniently enter their hours; improving productivity levels, and reducing your overall revenue leakage caused by inefficiencies. Arrow PSA brings clarity to your time tracking by enabling budgeting at the task, task group, and project levels. Increase your organization’s profitability with automated notifications and workflows based on actual versus budget. Drive your organization’s operational efficiency with Arrow PSA’s powerful resource management capabilities. Arrow PSA gives you the visibility and tools needed to manage the insights of your entire organization, work smarter based on these insights, and accomplish your goals by unifying and enabling your organization’s resources. Optimize your organization’s productivity by ensuring that your resources are appropriately scheduled today, while planning and forecasting for tomorrow; with intuitive resource planning and leveling tools, as well as analytics. Leverage the power of Salesforce reports and dashboards, integrated with Arrow PSA’s cohesive single system, so that all data can be reported on, and every user is looking at the same data. It’s impossible to make educated decisions about the future without looking at accurately recorded data from the past. Arrow PSA ensures thorough, powerful data management, stored on a single system, and available for your team. Professional Services Automation that makes sense.